A little later than had been hoped but we have now agreed a date when Lee Edgar will bring all or some of his coaching colleagues to Heckmondwike’s Firth Park to give those interested in improving their play, some further guidance. THE DATE IS SATURDAY 18th MAY. It will last from 10am until we all become brilliant shooters and pointers or just get tired. The coaching session will be open to all members of Heckmondwike and local clubs, Huddersfield, Mirfield and possibly Leeds. For this reason it will be advantageous to get your name on the list on our notice board to book a place. Those who are Northern Associate or Petanque England members will be FREE ADMISSION and those who are not will sadly have to pay the sum of £2.00. Good value either way I think. Our planning for the 2019 TOG24 LA BRITISH OPEN is now underway. It takes place on Saturday/Sunday 13th/14th July. If you are available and amenable to being press ganged into helping us host this brilliant event there will be a list going up shortly for you to enter your name. Help on either or both days will be much appreciated. If you were one of the brilliant crew that helped last year but are unable to do so this year can you PLEASE RETURN YOUR RED POLO HELPERS SHIRT to me or Jane, so that we can get them ready for our new team. Obviously if you helped last year and are keen enough to do it again. Please keep your polo at the ready and thank you so much. This entry was posted in Uncategorized on April 11, 2019 by clive1westley. This entry was posted in Uncategorized on April 6, 2019 by farrars2014. Attached is the updated Agenda for our upcoming AGM on Saturday 13th April. It is also in the PAPERWORK PAGE of the blog. There have been a couple of proposals which members should read and form their view ready for discussion and voting at the meeting. As today is the closing date for submitting nominations and proposals, if any member has further proposals or items for discussion they will be accepted at the meeting at the Chairman’s discretion for AOB. A proposal regarding the club logo was not included in the agenda as the club committee had previously discussed and voted on the issue in the February meeting. Progress had already been made to the point of imminent embroidery. I’m sure there will always be mixed opinions about such items but we hope your happy and proud to wear your club clothing. A hard copy will also be available on the club notice board. This entry was posted in Uncategorized on April 5, 2019 by clive1westley. A bright, sunny and mild day for our third month end melee of the year and 44 keen members turned out for the battle for points. This years competition is being run purely on the basis of games won with points difference the next level of separation. Results were quite surprising as 12 members won all three games and it was left to points difference to sort out the podium finishers.A good day for Pam and Alan Wallace as they were drawn together for their last game and celebrated with a 13-0 victory. This impressive score earned Pam third place with three wins and plus 25 points. Alan came second with three wins and plus 28 points. However no-one could prevent Janet Spencer taking the top prize with three wins and plus 29 points. Other 3 game winners were Chris Hopkins, Bill Barnett, Cath Clegg, Ian Fitton, Ken Billington, Tony McDonald, Alan Norfolk, Peter Wharton and myself with just four points covering all nine players. Well done everyone for an enjoyable day’s play and in particular to Janet for her spot at the head of the podium. With three months completed there is no-one with nine victories. Just two have 8 wins with Alan Wallace heading the league with 8 wins and plus 53 points and myself just two points behind in second place. A long way to go but its clear points difference is going to be a critical decider in the coming months. Full results of the melee and the updated league table can be viewed on the RESULTS PAGE of this blog. We are just two weeks away from our AGM meeting on the 13th April. As yet I have received no nominations for positions on our committee. I have unofficial notification that all current committee members are prepared to continue in their role if accepted by the membership. There is a proposal regarding membership fees for new members joining towards the latter months of our year and also a proposal to change the definition of casual member status. Details of these will be included in our agenda which I will issue in 7 days time. If you have proposals or nominations to be included in the AGM business please try to get them to me during this next week so that members can consider them in the agenda prior to the meeting. Please remember the AGM is a unique meeting of members with fairly specific topics to discuss and renew. You may have things you would like to suggest, discuss that fall outside this AGM range of discussion. These can be passed to a committee member at any time to be discussed at our regular committee meetings. If considered important you could attend a meeting to clarify your points and topics. Topics for Any Other Business need to be with me by Saturday 6th April to ensure inclusion in the agenda. Any item not in the agenda will only be included in the meeting at the discretion of the Chairman. This entry was posted in Uncategorized on March 30, 2019 by clive1westley. If you have a moment to spare next Tuesday 12th March you could help our club get a grant that would help us improve our facilities and attract new members in the future. Some of you will remember a few years ago we gained a similar grant that enabled us to buy the boules we lend to visitors. Well the same scheme, “ITS UP TO YOU” is available again in Heckmondwike. 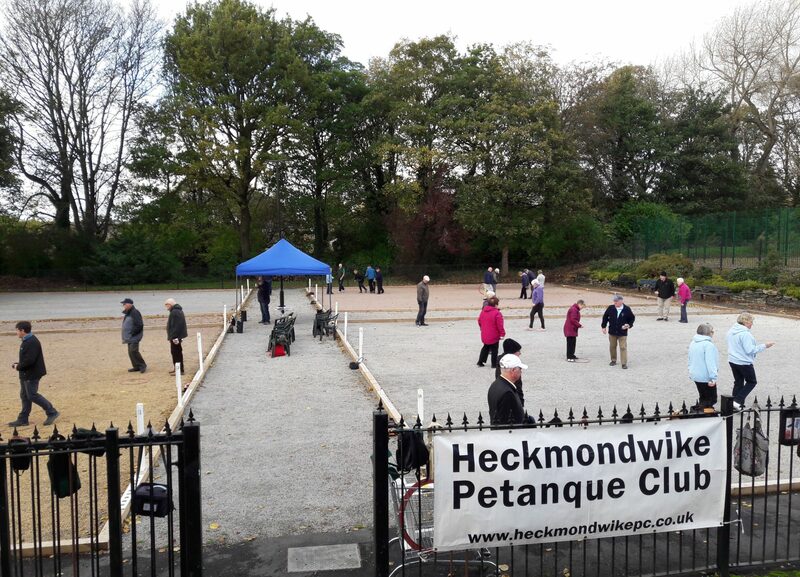 Its up to us to display how good a sport and pastime petanque is and anyone visiting Heckmondwike library between 3pm – 7pm will be invited to award stickers to ventures they like. The more stickers your venture is given then the more likely that you will get the grant you have requested. This entry was posted in Uncategorized on March 7, 2019 by clive1westley. This blog is primarily to advise all members that we will be holding our AGM at Firth Park on Saturday 13th April, 10am start. The initial agenda can be seen on the PAPERWORK PAGE of this blog. If you have topics, nominations or proposals that you want to include in the meeting can you please email them to me by Friday 5th April so that I can issue an updated Agenda in time for everyone to consider. If you would like to nominate someone for a post on our committee please check with them that they are happy to be nominated. It’s probably time we had a new secretary so start thinking. On the petanque playing side it was a good day for some of our members on Sunday when we hosted the Northern Region’s penultimate winter league event. Playing in her first competitive event, Gemma Benson teamed up with Ted Beetham to win four of their five games and take fourth place. 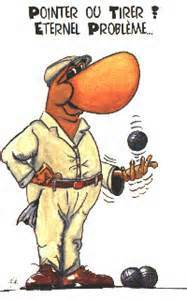 Pam and Alan Wallace also had a good day winning four games and tied for second place with Le Dragon IV. Kath Westley finally got herself a decent partner and achieved five wins out of five and first place. It’s a great pity that Sylvestre doesn’t pass our way a little more often as I’m sure many of us would benefit from watching his technique. Well done everyone. Several of our members took part in the event and all achieved some notable wins on a day that started dry and relatively mild but by the third game the rain arrived to give everyone a good soaking. The final Northern Winter League event is at Huddersfield on the 17th. At the moment the entry is full but it’s worth keeping an eye on the Northern site as there may be a few drop-outs if you want to play. On Friday 27th we held our Annual Quiz at Hanging Heaton Golf Club. An excellent number of 71 folk entered and most teams scored some very respectable scores in yet another brilliant quiz provided by Quizmaster Mr Nutter. We enjoyed an excellent supper and to cap it all off we were able to generate a wonderful total of £300 to donate to our chosen charity Forget Me Not Children Hospice. A great thank you to all who took part and made the evening a very enjoyable one. Special thanks go to Jane Farrar who organised the whole evening. Finally, I have been trying to come up with an idea of how to streamline the melee draw system to prevent the minor chaos when 58 members turned up a week or so ago. Here is my next offering. Firstly we have sufficient piste designation sheets to cater for 100 players at least. To avoid losing cards during the draw for each game we have bought some numbered discs and made a hook board, (pictured below). My dastardly plan is that after learning the number of folk present using the peg board we put the appropriate number of discs into a bag and do a draw. Once members have drawn a disc and know their number they should put their disc on to the appropriate numbered hook. PLEASE DO NOT TAKE IT TO THE TERRAIN WITH YOU. However, if it does happen, we will immediately be able to see it as the hook will be empty and showing its red number. That’s when the security guards will burst into action to hunt down the culprit and return the missing disc to its hook to do the next draw. I’m still building the stocks and a ducking stool so for a while at least punishment will be pretty mild for such a heinous act. This entry was posted in Uncategorized on March 5, 2019 by clive1westley. The February month end melee broke many records on Saturday. Apart from it probably being the sunniest and warmest February melee since the club was founded, for the third time since the new year we had a record attendance. An amazing 58 members took to the terrains. As you might guess it brought it’s own hiccups. Firstly we hadn’t got draw cards for more than 54 so a quick scramble to create a few extras ensued. A minor admin blip followed as the pile of cards got split and a few players had to wait for cards to determine their partners and opponents. Nevertheless we celebrated the plus points of a massive turnout in glorious sunshine. Ten players achieved the glory of 3 wins from three games and so points difference determined the final positions. Four players each had 3 wins plus 15 points and so Gordon Walsworth, Pauline Fenton, Kevin Hepworth and myself shared 6th place. 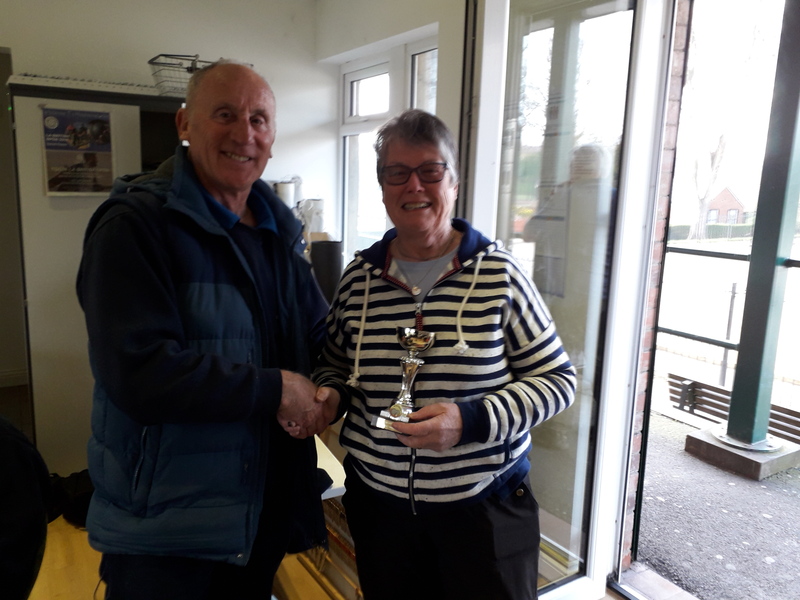 Doreen Hunter took 5th place with 3 wins plus 17 points and just a point ahead was Ken Hutchinson on 3 wins plus 18 points. Sharing second place with 3 wins plus 20 points were Pam Wallace and Roger Johnson. This month’s Champion, however, with 3 wins plus 23 points was Trevor May. Well done everyone and thank you for being so patient while we came to grips with an amazing turnout. The full results and the updated cumulative league table can be viewed on the RESULTS PAGE of the BLOG. We begin March with a Northern Region Winter League event on Sunday 3rd. There are already of 20+ teams for the 5 round Snake competition but still plenty of opportunity for more teams to enter. On 16th we have a members Triple competition scheduled. Draw for partners for a three round snake. If numbers on the day don’t add up suitably then it could be changed to a Pairs. This entry was posted in Uncategorized on February 24, 2019 by clive1westley.